Spicy Tequila Sunrise made from tequila infused with fresh pineapple chunks and jalapeno is a colorful drink to celebrate the remaining days of summer. 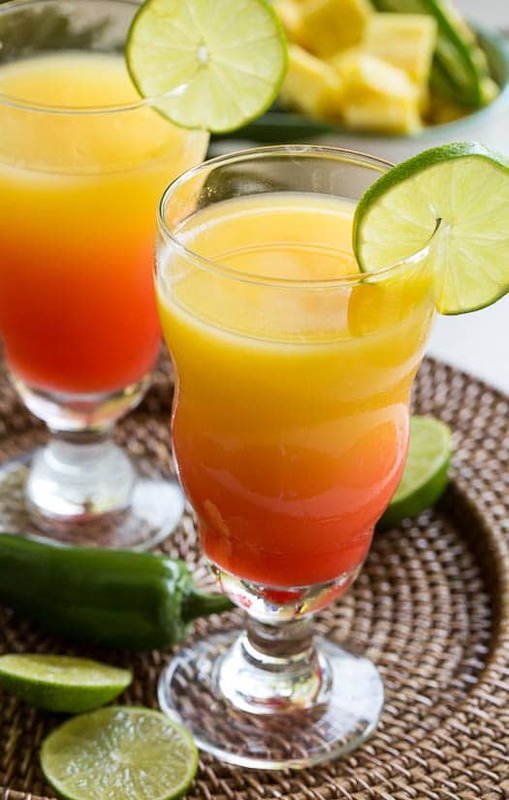 There’s a whole lot of flavors in this cocktail, from the kick of the jalapeno and the tropical flavor of the pineapple and candy sweet flavor of grenadine. This is the last no-school weekend of the summer for us and boy has the summer flown by fast. I feel like we’ve hardly even had time to relax. Refreshing, fruity cocktails are one of my favorite things about summer and I’m determined to enjoy a few more before apple cider season sets in. Infusing liquor has become one of my favorite things to do. It all started with some candy corn infused vodka a few Halloweens ago. I think you can imagine what that tastes like. 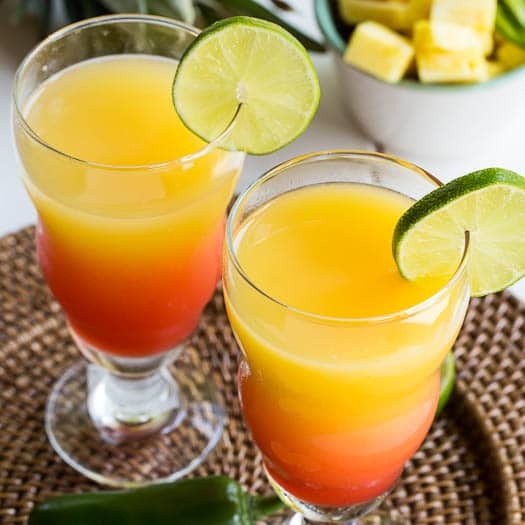 This Spicy Tequila Sunrise is made with tequila that’s been infused for 2 days with pineapple and jalapenos. Many suggest infusing for much longer periods of time, but I found 2 days was plenty of time. You can infuse as much or as little tequila as you want. We’re not heavy drinkers so I tend to just do it in a Mason jar. There’s no need to refrigerate it. A dark, room temperature space will do. If I was going to infuse it more than a few days, I would probably do it in the refrigerator. This recipe makes 2 super large drinks. Be prepared to have a really good time. Tequila for all my friends! 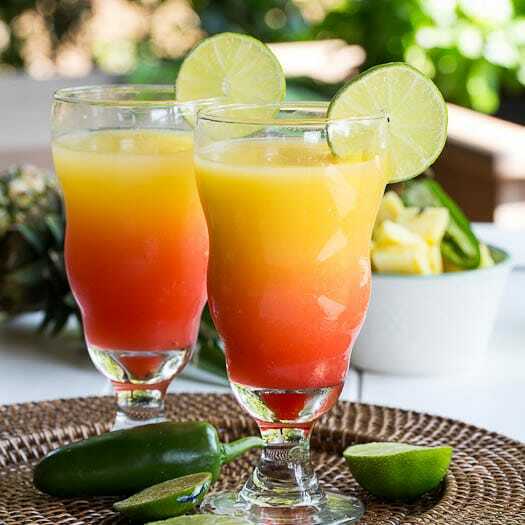 Celebrate summer with this Spicy Tequila Sunrise recipe made with pineapple and jalapeno infused tequila. It's a delicious sweet/spicy combo with a tropical flair! Pour tequila into a Mason jar. Add pineapple and jalapeno. Screw lid on and leave in a cool, dark place for 48 hours. Strain tequila and discard pineapple and jalapeno. 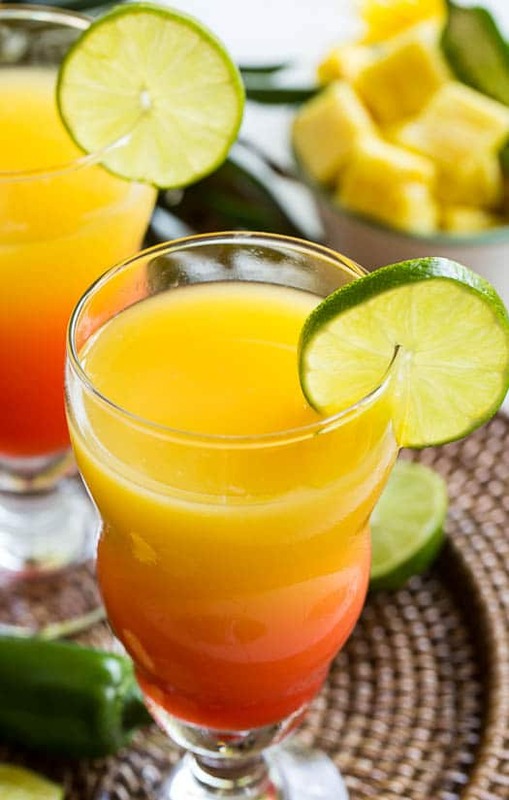 Combine orange juice and 2 1/2 ounces of tequila in a cocktail shaker with ice. Shake and pour into 2 glasses. Slowly pour 1 tablespoon grenadine into each glass. This entry was posted in Cocktails and tagged Jalapeno, pineapple, spicy, summer, tequila. Bookmark the permalink. Such a beautiful cocktail! I just can’t get over the colors! This is such a pretty cocktail! 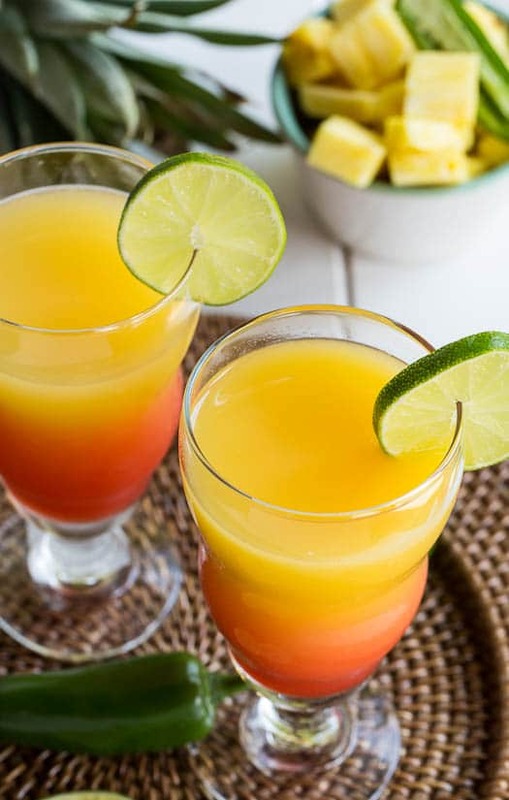 I love the actual sunrise colors (super neat effect) and the addition of a bit of spice to a sweet drink sounds lovely. 🙂 Cocktails usually give me a headache from all the sugar, but a spicy kick sounds perfect! I’ve been meaning to make pineapple infused vodka for a few years now. Maybe I’ll finally get around to it! What a pretty drink, Christin! I love the pineapple and jalapenos together. Perfect for the summer! Pineapples and jalapenos combination!! How awesome is that!! Loving the sound of this drink!! I am always up for a drink with a kick.. 😉 Love it!! Your cocktail recipes are the BEST, Christin! This is such a fun twist and I will definitely have to try it, seeing how I have a ton of jalapenos on hand! I have never come across pineapple-jalapeno tequila but I am intrigued and must find some so I can try it! Great recipe, Christin! Thanks Julie! Hope you are having a wonderful weekend!